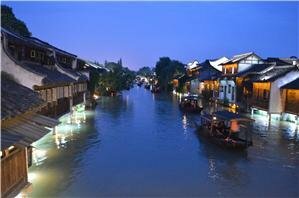 Wuzhen is one of the six famous ancient water towns south of the Yangtze River. It’s within the triangle formed by three top tourist cities: Shanghai, Hangzhou, and Suzhou. It has charmingly restored architecture and canals. 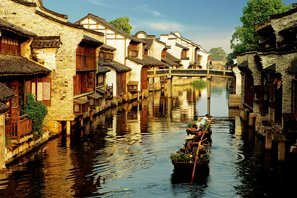 Though some people complain about its commercial atmosphere, restored buildings, and the crowds, the charm and the elegance of this ancient water town is undeniable. 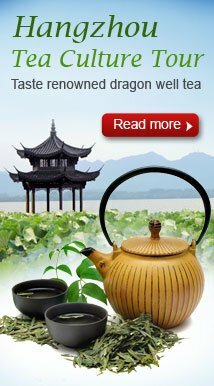 Video about Wuzhen Water Town. March to May is the best time to visit Wuzhen for the comfortable temperature and spring scenery. The mist and drizzle make the ancient town more beautiful. Fall is also a good season to travel Wuzhen for the cool weather and clear sky. 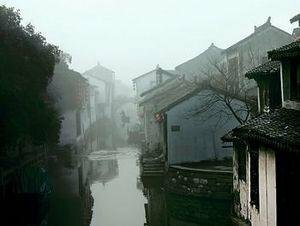 Winter is quite cold (above freezing) in Wuzhen, but driest, and you can enjoy a less-crowded time there. If you visit it in the heat of summer, avoid the midday crowds, and be careful of heatstroke. The street on the entrance side has souvenir shops and restaurants, and the street on the far side has various museums, exhibiting beds, clothes, blue flower printed fabric, etc. There are various exhibitions showing the old way of life in this water town. In the peak season the streets are thronged with Chinese tourists (few foreigners), and the waterway is busy with single-oar skiffs carrying up to six passengers up and down the waterway. The biggest highlight of East Area are the folk performances, such as shadow plays, Huagu Opera, martial arts performances on boats, and bamboo pole climbing. Shadow plays are a form of entertainment created by projecting the shadow of handmade figures onto a screen. It is a traditional art form. Accompanied by traditional Chinese musical instruments, such as the flute, gong, and erhu, shadow plays are quaint and rich in culture. 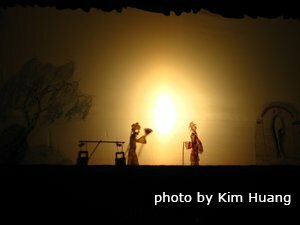 Show time: 8:30–11:20 am; 1:00–4:30 pm (every 10 minutes)Huagu Opera, or &apos;flower drum&apos; opera, is a local drama that portrays rural life through stories and lively music, with traditional costumes. As Huagu is sung using the local dialect, this form of opera is still widely appreciated by the locals. Martial arts performances are performed on permanently-moored boxing boats. Masters of the martial arts fight to the accompaniment of clamoring gongs and drums. Clad in kung fu suits, these warriors battle with sabers, swords, and other traditional weapons for the enjoyment of spectators. Bamboo pole climbing is a unique performance of Wuzhen, Tongxiang County. It’s a kind of acrobatics. The acrobat does thrilling acts on a towering bamboo pole. The West Area offers a much better experience than East Area. You will find the East Area is interesting, but West Area is positively charming. West Area is less crowded, quieter (during the day), and is more spacious. There is a marsh with a firefly aviary, a wooden irrigation system, and a sizable pagoda at one end by the Beijing–Hangzhou Grand Canal. 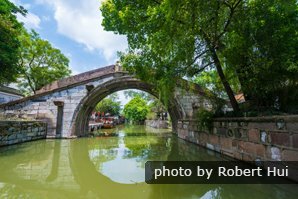 It is similar in layout to East Area with a main waterway and streets either side, but longer by 1,000 meters, with a good number of side alleys, bridges, ancient docks, and secondary waterways, which makes it a fascinating place to stroll around. West Area has been rebuilt and renovated in the original style with many charming architectural features: colonnades, small bridges, balconies, piers, wooden windows and doors, and gray stone walls and paving. Xi Zha has few local residents and is instead given over to accommodation for visitors. Xi Zha is beautifully lit at night, subtly highlighting various architectural features and the bridges. The streets of Xi Zha are lined with guest houses, restaurants, bars, and souvenir and arts and crafts shops. Thus people say it’s more commercial than East Scenic Area. The budget level hotels are like home stay inns. The rooms either face a canal or street. All of these hotels are managed by the West Area Tourist Office, and guests cannot contact the hotel owners beforehand. The reception desk is located opposite Yusheng Restaurant, where there is a computer for you to search for budget-level hotel information. As long as there are vacant rooms, guests can usually select a specific hotel at the reception desk. 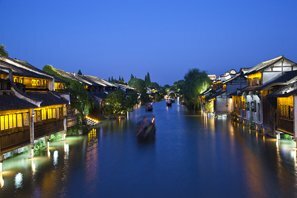 Note that the star-rated hotels in Wuzhen do not necessarily meet all national four or five star standards. It means they are generally up to star rating. We recommend two such hotels. Tong An Hotel is the largest hotel in Xi Zha, with the most facilities and various room types. Some standard rooms face Yuanbao Lake. Suites 405–410 are most impressive, with a small balcony along the canal, and elegant antique decoration. Zhaoming Hotel is newly opened, with a tranquil atmosphere and verdant trees. There is only one room type, with two beds separated by wood-carved windows. There are three boutique hotels (or club hotels) at Xi Zha: Shinetown, Splendid Clubhouse, and Healtown. Rooms are mostly king-bedded. Splendid Clubhouse is the most luxurious. Shinetown features courtyards. Healtown is the lowest priced. 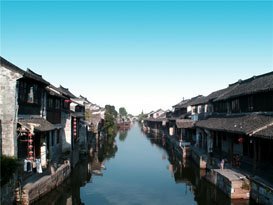 Wuzhen Water Town is in Tongxiang County, about an hour north of Hangzhou. It&apos;s a small town without airport or train station, but lots of local tourist transport. The K350 bus from Wuzhen Bus Station to Dong Zha takes 5 minutes, or walk for 15 minutes. Xi Zha takes 10 minutes by local cab, or 30 minutes by foot. The K282 bus from Tongxiang Train Station to Wuzhen Bus Station takes takes 40 minutes. A taxi takes about 20 minutes. From Nanjing (or further) — take the bullet train! 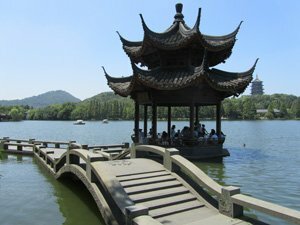 See more Hangzhou tours. Our tours are customizable. The Top 8 Ancient Towns Near Shanghai — Which Should I Go To?